Kevin James + MMA = ?! Pretty much my thoughts, too. When I think of MMA and the UFC, I tend to think of ripped guys in incredible shape pounding the crap out of each other. Kevin James? Not so much. James is first and foremost a comedian, and I admit I’m a fan of “King of Queens,” but he isn’t exactly renown for his physical prowess. He did, however, wrestle and play football in high school, suggesting that at one point he was in decent physical shape. Drew Carey, another famous big-boned comedian, was in the Marine Corps, so it’s not as though all fat comedians were always fat. So I went into the movie with pretty low expectations, figuring it to be a slapstick comedy with a little action. Interestingly, it’s the other way around, and it works well. Scott Voss (James) is a 42-year-old biology teacher who’s grown disillusioned with teaching. Once a teacher of the year (in 2002), his students no longer care, nor does he. When one of his brighter students, Malia (Charice) asks him a question, he dismisses it, telling her it’s unlikely she’ll ever use anything she’d learn in his class anyway. Overhearing the school orchestra practicing, he stops in and talks to Marty (none other than the Fonz, Henry Winkler). Unlike Voss, Marty is inspirational and genuinely cares about his students. During their conversation, he also finds out his wife’s pregnant; given that he’s older and she’s 48, obviously they weren’t expecting it. At a faculty meeting in the gym, Principal Becher (Greg Germann) informs the faculty that due to budget cuts, a lot of extracurriculars would be cut, including the music department. Appalled that one of the best teachers would be losing his job, Scott resolves, along with Bella (Salma Hayek), to raise the $48,000 necessary to keep Marty employed. Struggling initially, Scott starts by teaching immigrants in an effort to help them pass their citizenship test. When he goes to the apartment of one student, Niko (Bas Rutten), he watches a UFC bout with Niko. Upon realizing the loser gets $10,000, he realizes he can make a lot of money by fighting. Being a former Division I wrestler, he agrees to keep tutoring Niko in exchange for learning how to fight. Predictably, Voss struggles in his first few bouts, but as he learns, others start to take notice. I was pretty surprised at the numerous moments of gravity in the film. Across the nation, schools are facing deficits and budget cuts. Quality teachers are leaving schools that desperately need them to take more lucrative positions. The recent teachers strike in Chicago has done nothing to dispel the notion that teachers are unsatisfied with their compensation. Another film that just came out highlights the possibility of parents invoking the parent trigger law in the case of underperforming schools. The teachers in the film are forced to accept a salary freeze and lose their budget for supplies. In fact, although the MMA fighting is the vehicle for the film, it’s far from the focal point. In one of the scenes in which Scott is trying to woo Bella, they discuss the difficult task of getting through to every student. “You can’t speed it up for the smarter students; you can’t slow it down for the slower students,” Scott laments. At times, I had to remind myself this was supposed to be an action comedy. Once the action starts, though, it’s interesting to see James in the ring. He doesn’t undergo a magical transformation after which he weighs 180, but he obviously got into decent shape by the end of the film. For its part, the UFC contributed its name as well as some of its participants to the film. Anyone who follows MMA and the UFC will recognize several people in the film: Bas, Joe Rogan, Mark DellaGrotte, Krzysztof Soszynski, Bruce Buffer, Stitch Duran, Wanderlei Silva, Chael Sonnen, and a few others. I won’t say too much about the fighting itself, as I’m nowhere close to an expert on MMA. If my friends buy one of the PPV events, I’ll go over to their place and watch them, and I recognize several of the fighters, but I couldn’t tell you the difference between all the holds and chokes. I tend to think the film is in the mold of the Major League films: the athletes act as advisors and some play roles in the films, but in general the action’s a bit more than one would expect in a bout. My friend Joey, a pretty avid fan of MMA, said although the moves were real, they were pretty over-the-top to expect in a bout, especially the finale. As far as the ending, well it wasn’t exactly what I predicted, but it fell pretty much in line with the tone of the film. This film will inevitably draw comparisons to the Rocky franchise, and there might be a few similarities in the lead up to the finale as well as the message of inspiration, but I’d leave it at that. The film’s actually meant to be a pretty inspirational story (one substory involves Voss’ brother, who’s unhappy with his painting business but turns out to be a terrific cook, pursuing his dreams) as well as a testament to the power teachers have in a child’s life. At times, it’s actually pretty poignant, but the messages are hammered into the audience’s mind to the point of overload. All in all, though, it wasn’t nearly as mediocre as I’d expected. 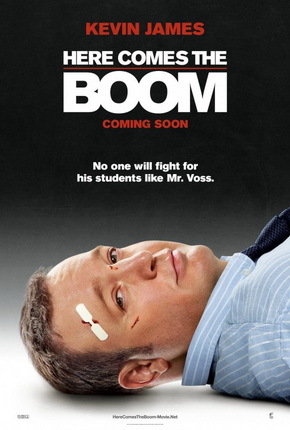 It’s not going to be in the running for awards at the end of the year, but you could do far worse than Here Comes the Boom if you’re looking for some entertainment this weekend. Here Comes the Boom gets a B-.